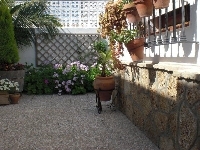 Superb first floor apartment of villa in a quiet neighborhood and just 5 minutes walk from the Regla Beach. 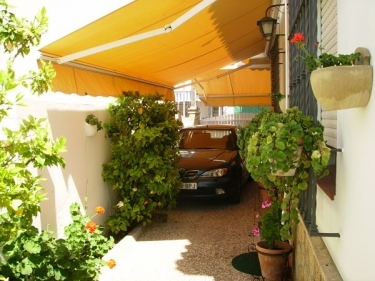 The house, sunny and bright is very well equipped, has, among other things, air conditioning in the living room and bedrooms, wireless internet, garage and a private terrace with an awning and garden furniture. The house, semi-detached house, is located within the urban area in a very calm zone of low constructions. To the Regla Beach, to about 300 metres, it is walked in 5 minutes; and to the population centre, in about 15 minutes, also walking. 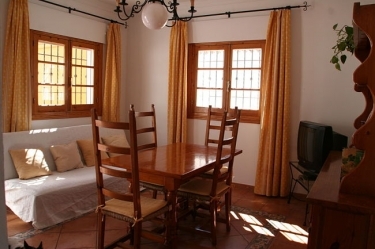 In a radius of 100 metres of the house there is supermarket, stores, butchers, fishmongers, bars and restaurants. What's in the dining room? In the lounge there is a sofa bed that converts into a double bed, table and chairs for four people, TV., Satellite TV, wireless internet and air conditioning (cold / hot). The kitchen is fully equipped: dishwasher, washing machine, microwaves, fridge freezer, 4 burner stove, toaster, coffee maker, iron, ironing board, crockery, cutlery and kitchen utensils. *Bedroom 1: Double bed (1.35 x 2 meters), cupboard and air conditioning (cold / hot). * Bedroom 2: Two beds of 0.90 x 2 meters, cupboard, TV connection and air conditioning (cold / hot). *The living room has a sofa bed that becomes a double bed. *If needed, can provide a cradle with his clothes (Upon request). *The apartment comes with bedding in sufficient quantity. There is only one bathroom with shower, bath of 1.35 meters, bidet, wc and washbasin and Hairdryer. The apartment is supplied with enough towels. Dishwasher, air conditioning in the lounge and bedrooms, secure parking for one car, internet access and a magnificent terrace of 30 meter with awning and garden furniture. 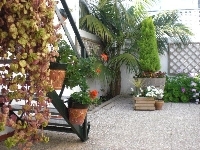 *The garden is shared with the owner, who lives on the ground floor of the house. 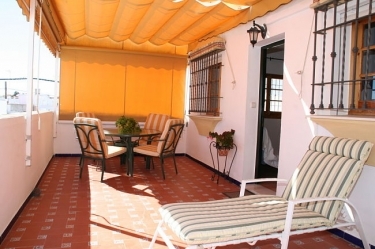 *Terrace of 30 meters, with awning and garden furniture. In Chipiona and around Chipiona you can see and practice a lot of activities. Of course everything about the sea and the beach, such as fishing, swimming, surfing, snorkelling, scuba diving, sailing, water skiing, etc. We can also practice golf, tennis, horseback riding, boating, beach walking, biking. Chipiona has numerous restaurants and bars. And not far away two parks declared Biosphere Reserve: The Park of Doñana Natural Park of Grazalema. Public swimming pool, 500 meters. Supermarket, shops, fishmongers, butchers, bars, restaurants, 100 meters. Chipiona it is located to 54 km. Of Cadiz, the capital of the province. From her, it is acceded to Chipiona by the A-4 (Madrid-Cadiz), until El Puerto de Santa Maria and we will take the A-491 there that will take to Chipiona. If we come from the north, from Sevilla (to 105 km.) we will take the AP-4 until Jerez de la Frontera and the A-480. Also we can leave the AP-4 in kilometer 44, in the population of Las Cabezas de San Juan and to continue until Chipiona by the A-471 and later the A-480. Jerez de la Frontera, 27 Km. El Puerto de Santa María, 25 Km. Sanlúcar de Barrameda, 8 Km. NEXT AIRPORTS: Jerez de la Frontera, 34 Km. ; Sevilla 105 Km. ; Málaga 258 Km. And next few months, Gibraltar to 145 Km. NEXT RAILWAYS: Jerez de la Frontera 27 Km. ; El Puerto de Santa María 25 Km. And Sevilla (High Speed) to 105 Km. Several companies of buses dedicate to the transport of travellers by Road between this and other villages. The quiet town of Chipiona, is located northwest of the coast of Cadiz, on the Costa de La Luz, just 52 km. Cadiz, the capital of the province is the oldest city in the West (3,000 years). The origins of Chipiona goes back to Roman times. The most emblematic monument in Chipiona perhaps its lighthouse, which dates from 1867 and is built at Punta del Perro, in the same place where Quinto Servilio Cepión, the tower was built in 140 BC. We can also see the Shrine of Nuestra Señora de Regla, with its Moorish cloister of the XV century and the image of the Virgin (twelfth or thirteenth century). The Parish of Nuestra Señora de La O (XVI century), the Castle was probably built on another of Arab origin around the year 1295 and the Fisheries Corrales (believed to be Roman). From Chipiona, you can visit the wineries, the School of Equestrian and the Racing Circuit (in Jerez), the horse racing on the beach (in Sanlúcar de Barrameda), or to the Route of the White Towns in the Sierra de Cadiz, north of the province. The route enters the Grazalema Natural Park, declared a Biosphere Reserve, a must for those who enjoy active tourism and rural tourism. And not far away, across the river, another natural park, the Doñana Natural Park. Since Chipiona we can make excursions to Cadiz (52 km), to Seville (105 km), to Jerez de la Frontera (27 Km), to Ronda (150 km), to Malaga (260 km), to Gibraltar (145 km) toTarifa, the Windy City (150 km), to Portugal, Vila Real de Santo Antonio (250 Km), and even to Morocco. To go to Morocco, we will do by road to Algeciras (130 km), then board the ferry to Ceuta (1 hour of trip, 6 crossings daily) or to Tangier (1 hour trip, 40 trips per week). You can ship the car at the Ferry. In the area of Chipiona you can see and practice a lot of activities, but especially we can enjoy its 12 Km. of magnificent beaches of fine golden sandy, some of them, awarded with the Blue Flag of the Clean Seas of Europe. Air conditioning and heating throughout the house. (Price: 1€ per 4 hours of use).